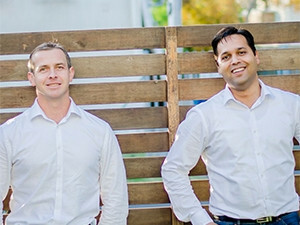 Paradigm Group directors Nolan Daniel and Shadab Azeem Rahil. Paradigm Group, an ICT solutions provider, has acquired an equity stake in mobile emergency application provider, Rapid Response, in a "multimillion-rand deal". Under the deal, Paradigm bought a 20% stake, while the Rapid Response founders will retain the remaining 80%. Rapid Response is an emergency services app launched in 2013 that is said to "transform a mobile phone into an emergency panic button". It was founded by Marlize Holtzhausen and Gerrit Cloete, and has experienced tremendous growth since its inception in 2013. The app makes use of location-based services, including near-field communications technology, to alert emergency services providers such as ER24, a contracted security company, or personal contacts that an emergency has occurred. Speaking to ITWeb this morning, Shadab Azeem Rahil, director of Paradigm Group, said the companies will continue working as separate entities. In a statement, Paradigm Group says it will bring complementary competences to Rapid Response in the form of ICT services, enabling it to consolidate its market position and execute on business strategy. Rahil believes Rapid Response is an attractive product, especially from SA's safety perspective. He notes Rapid Response will also add to the ICT stack that Paradigm Group already has. Earlier this week, it was announced Huawei mobile devices would be embedded with the Rapid Response app. "Looking at what Marlize and her team have achieved in such a short period of time, we believe wholeheartedly that Rapid Response will be a market leader in their field and grow to become a successful global brand," says Nolan Daniel, also a director of Paradigm Group. "Our investment in Rapid Response aligns with a broader strategic plan focused on finding and investing in innovative South African technology companies." "Considering the high level of interest we have experienced in Rapid Response, it is essential to ensure that we can meet the growing needs of the marketplace to further differentiate and establish our offering," Holtzhausen says. "There is great synergy between our two companies and Paradigm Group's innovative approach to technology reverberates Rapid Response's."